Analysis of the latest figures from the Department of Housing shows that foreigners now make up 12p of the Spanish property market, and could be crucial to any recovery. All the more reason for Spain to rue the new asset reporting regulations that hammer expats. Though published at the end of February, I haven’t had time until now to analyse the data on Spanish home sales published by the Department of Housing, part of the Ministry of Public Works (Fomento), based on figures from the Notaries Association. 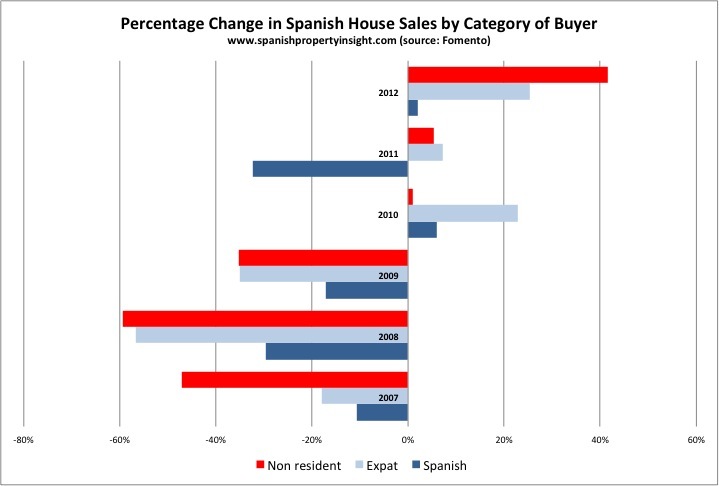 I made the time now because these are the most accessible figures that separate buyers into Spanish residents, expat residents, and nonresidents (who, by definition, are buying second homes). In the light of the new worldwide asset reporting requirements for residents of Spain, I wanted to clarify how important foreigners are these days to the Spanish property market. As it turns out, they are vital. Already 12pc of the market (back at pre-crisis levels), foreign buyers are growing fast in number, and could be critical to Spain’s moribund property market. 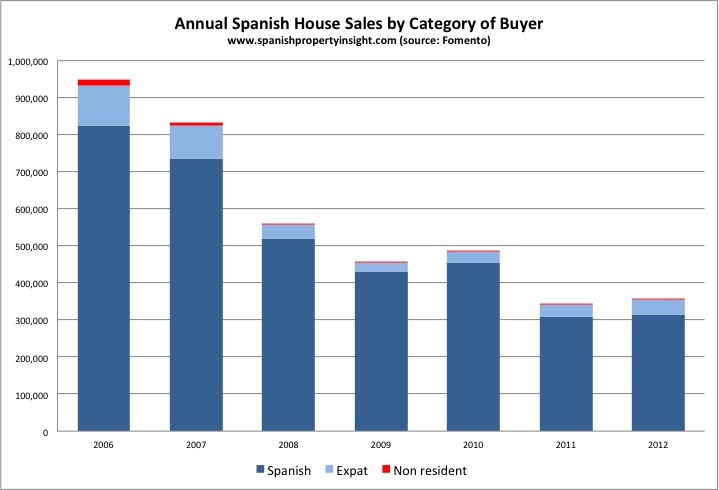 As illustrated by the chart above, home purchases by expats living in Spain increased 25pc last year, to 40,848, whilst sales to non-residents surged 42pc to 3,603. In comparison, purchases by Spaniards rose just 2pc, even with the incentive to buy before mortgage tax credits expired at the start of 2013. Though sales to non-residents increased the most, they were still tiny in absolute terms (just 1pc of the market). Expat buyers, on the other hand, bought 40,484 homes in Spain last year, 11pc of the total, up from 24,520 in 2009. This shows that expat buyers – a group that includes all foreigners living in Spain, but is mainly comprised of Northern European “climate migrants” (as opposed to economic migrants) – will play a crucial role in any recovery. It’s always a minority group that starts the turnaround in every market (the herd come later). As cash buyers from stronger economies, expats will be the ones who sow the seeds of the recovery in Spain, if they are allowed to. The problem is that Spain’s new law forcing expats to declare their worldwide assets could send the market into a tailspin. Its complex reporting requirements and disproportionate fines will put many, if not most foreigners with assets abroad, off the idea of living in Spain. Many expats already here will leave, if they can sell their homes: I am already hearing anecdotal evidence of the first signs of a stampede for the exit. If the Government does not make the reporting requirements less onerous for expats, I worry that sales to foreigners could collapse in the course of this year. I recently reported that foreign buyers are flooding back into the market, with 38,312 non-residents buying properties in Spain last year, according to figures from the notaries, reported in the Spanish press. I imagine the press reports were wrong. They must have been talking about expats or foreign buyers (expats plus non-residents), not just non-residents. On the other hand, all the estate agents I talk to report that 80pc or more of their sales are to non-residents, which calls into question the figures from the Department of Housing. It’s difficult to know which figures to trust, but it’s clear that foreign buyers are important. You know “all the tea in China”? Well the Spanish Government would have to be offering that and I’d still be running a mile from buying a property. I’ve got the cash, I know where I’d like to buy but I don’t trust the government not to steal my money. I saw Spain described recently as “not southern Europe, but North Africa”. I’m not handing over my money until someone has sorted out the corruption in Government. Spain has managed to “bribe” it’s way back into the third world. They really are killing the golden goose, when they should be encouraging more expats and holiday homes. Instead they’re condemning their market to stagnation. Maybe they’re hoping to profit from the Russians fleeing Cyprus. Good luck with that. There is a big difference between 38,312 and 3,603 and I don’t believe that there have only been sold 3,603 properties in 2012 to non resident. It’s almost nothing. I have asked the Notaries Association several times about this but they haven’t responded. I hope you will dig further into this, so we can get a clearer picture of the market. Yes Ole, I use Notaries Association and General Council to refer to the same thing. I will try to get to the bottom of this mystery. Having lost a fortune already on the drop in my property value and now being potentially hit by the asset declaration, I’m out of here if only I could sell. I rue the day I bought a house in Spain – the country is corrupt and short-sighted. I cannot understand how these people (in Govt) manage the country. They have jumped on the tax bandwagon and are squeezing the very group of people who have sustained the country through thick and thin, although now it looks as though they are fed up with continuing. The south of Spain doesnt “look” particularly bankrupt, fast cars, yachts, expensive shops etc etc still in full flood but with maybe slightly fewer people. When will they wake up in Spain and start valuing the people who have saved the entire country going down the pan. The amount of money embezzled, stolen and filled the huge bottomless pockets of the ayuntamientos is mind-boggling – they are the ones who should be squeezed and imprisoned.